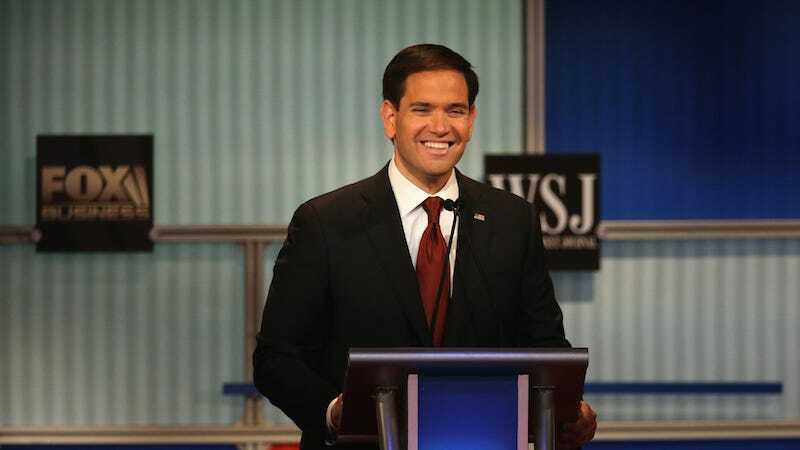 Congratulations, Marco Rubio! Your campaign is no longer the equivalent of my high school grrl band. On Wednesday, Rubio’s South Carolina team moved out of the staffer’s garage it had been operating for the previous several months, and into an actual office. While Rubio’s advisers say they’re simply executing the next phase in a carefully crafted campaign blueprint, there’s no doubt the team’s early penny-pinching was driven in part by necessity. The senator’s fundraising has been underwhelming and his money totals trailed several rivals through summer and fall, including a lackluster $6 million haul in third financial reporting period of the year. Rubio’s team has been expanding nonetheless, hiring staff in Nevada and upping the frequency and size of events in Iowa, New Hampshire, Nevada, and South Carolina. Despite attention from major donors after favorable performances in the last few debates, the stinginess prevails. In Nevada, a staffer reportedly asked a neighboring pizza place for the WiFi password and had the entire office use the code for three weeks until the restaurant requested they stop. Rubio! Get ahold of yourself!